Missouri River – Bismarck Mandan 5-23-11 14, a photo by NDNG on Flickr. Three years ago, when Iowa was being swamped with water, I wondered just how bad it could get in Lincoln if Mother Nature converged on it like it is other cities up and down the Missouri River today. Portions of University Place, East Campus, the Russian Bottoms, Malone and Clinton neighborhoods would be under water. Other vulnerable areas: the area around Beal Slough — from 14th Street to 56th Street along Nebraska 2 — and the area north of the stream called Dead Man’s Run from North 33rd to 48th streets. We don’t have a Missouri River or a Platte River running through town, but 11 creeks converge with Salt Creek in Lincoln, draining more than 1,000 square miles — all pointed like a gun at the heart of Lincoln. It’s easy to forget the city has battled more than 100 floods since 1900 — 17 of them major, two of them catastrophic. That’s why 10 dams and levees were built in the Salt Creek watershed in the 1960s, but even now, Lincoln’s earthen berms can only handle up to a 50-year storm. That is a pretty low threshold. Lincoln is protected by a 7-mile-long levee along Salt Creek that was designed to withstand 100-year storms, but detailed floodplain mapping in the late 1970s led the feds to conclude it wouldn’t stand up to a 100-year storm if all those streams peaked at the same time. The levee was built with dispersive clay, which is high in calcium and erodes and dissolves when it comes into contact with water. Which is why holes started showing up in the levee in the 1970s. Not exactly what you’re looking for in a levee. The levee was decertified as a 100-year-flood protector due to the clay material and fact that it isn’t high enough. And remember, scientists say climate change will produce more extreme weather — as we’re seeing now — and more precipitation in our area. The great 1908 flood in Lincoln — which killed nine and left 1,000 homeless — is believed to have been a 100-year storm. When it’s the middle of August and dry as a bone, it can be hard for city officials to get excited about updating flood plain maps, preserving flood storage and mitigating flood risks. City Council members sometimes act as if city officials are just trying to make work or put an onus on businesses. But you never know when Mother Nature is going to defy all expectations and swamp your city — and by then, it’s too late. 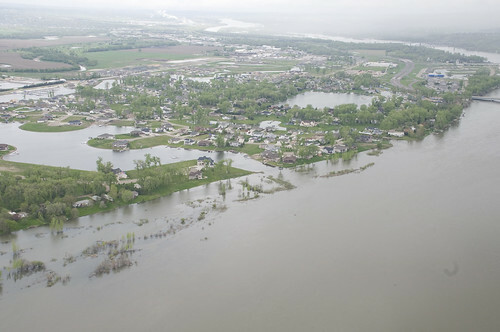 If the red state of Nebraska’s capital gets hit with a 100 year flood, how long do you think it will take for us to be going to Washington with our hands out pleading for a tax payer bailout. Oooops…no money there folks. Our tax cutting members of Congress will recommend that we pay for our own inaction, unless of course they are hypocrites.